As you gear up and get ready for another winter, it’s only natural you should take the time to question when you’re going to finally get into that brand new SUV you’ve been thinking about. You’ve been eyeing it’s roomy interior, lush amenities, four-wheel-drive and beloved third-row for a while now. So, when are you going to realize that you’re job as an executive, parent, taxi-driver, PTA mom, coach and master organizer qualifies you to get the SUV you want, but truthfully need to make your daily life that much easier. And when you consider that it doesn’t get any easier than online car buying, life in your new full size SUV just looks that much better. When you’re not looking for luxury, but have come to expect comfort, technology and updated safety features from top car manufacturers like Chevrolet, Ford and Dodge, it’s reasonable that these amenities won’t be priced at top dollar. American car brands have been successful in providing top quality products on a practical family budget. Below is a list of just these SUV’s. The Chevy Tahoe has been a bestseller with American families for decades now because of its sturdy construction, massive interior and powerful V8 engine. With enough room to sit 9 passengers the two rear rows are quite comfortable, while the third row will be best suited for children. Said to have one of the nicest interiors in its segment, it is also one of the very quietest. This is thanks to the addition of a thicker floor barrier which muffles sounds coming from underneath resulting in a truly quiet ride, well, at least when not carting around the little league team. The incredibly powerful V8 proves it can take on just about anything including the harshest winters and steamiest summers. It’s EPA fuel rating is average for its class: 16 city mpg and 23 highway mpg. Even given its large stature and size, reviews say it feels incredibly easy to drive and handles exceptionally well. With three trims to choose from, all available in 4WD, there’s a Tahoe that fits your needs and price range. Starting at $47,000 you can get as particular as you want up to $61,610. With ample leg room and spacious seating for all, even those in the third row, the Ford Expedition boasts a strong and efficient twin turbocharged V6 mated to a 6-speed transmission. With Ford’s new EcoBoost engine lineup powering its 2016 Expedition, its increased horsepower, torque and fuel efficiency are appreciated, although it still puts out comparative fuel economy of 16/22 city/highway. Technology enthusiasts will be impressed with Ford’s new infotainment system, SYNC, which is voice activated allowing for hands-free driving, and features a 4.2” display screen. A big plus for parents allowing their teenagers to drive their Expedition is the MyKey system. This programmable system allows parents to set maximum speed limits and have volume control for secondary drivers. Standard safety features include rear parking sensors and rearview camera. Starting price for an Expedition is $45,435. When the Yukon offers only two choices of V8 engines, there’s no questioning the power that GMC is packing the Yukon with. Despite its size, the Yukon is remarkably easy to drive thanks to its composed handling and responsive steering which along with the brakes provide decent feedback. Surprisingly, the base Yukon has less cargo space than many of its competitors while the XL trim provides arguably the most extra cargo space in its segment. 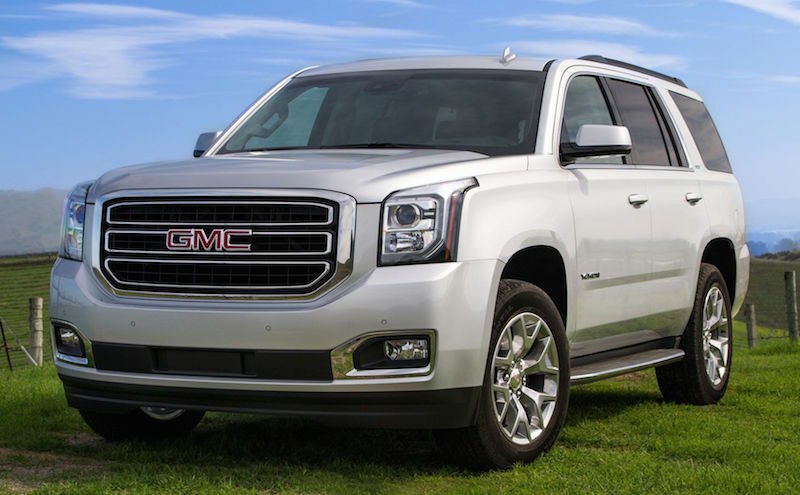 Excellent advanced tech features include equipment like OnStar 4GLTE Wifi HotSpot, 9 speaker Bose audio system are key in understanding why the Yukon is successfully rated top pick in large SUVs categories. It’s sheer power for towing that’s available on any trim level from base to Denali, is another reason the Yukon stays on top, that and it starts at $48,165 and can accommodate the pickiest driver up to $68,045.